The moment I saw this game, I wanted to review it. I’ve spent about half my life playing football and an unhealthy amount of time playing old football games not named FIFA. Ganbare! 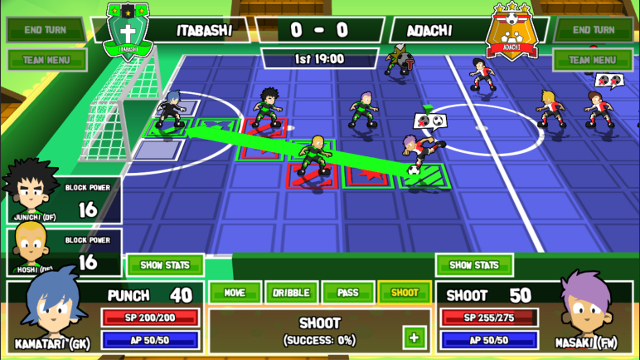 Super Strikers adapts the heavily strategic sport to a turn-based tactical RPG. Sounds good, but does it stand tall like the Bayern Munich defense, or disappoint like the U.S. Men’s National Team? 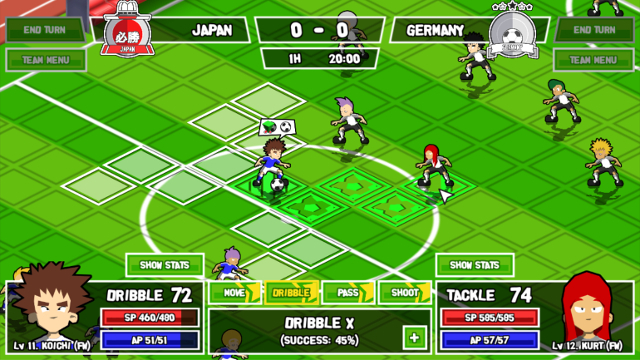 Each match involves moving players on a pitch divided into tiles. Everyone can perform two actions and attempt a slide tackle each turn, which lasts one minute in-game time. These actions consist of moving, passing, dribbling through defenders, tackling opponents, or shooting. Every action drains SP (Skill Points), of which every player has a set amount. When someone’s SP runs out, all of their stats are lowered for the rest of the half. While some of it regenerates at halftime, SP drains quickly if one player is too heavily relied on. Fortunately there are a few substitute players you can swap in, or just have two of them switch positions. Behold, the true Inazuma Eleven! Speaking of, every action except movement is determined by head-to-head number rolls, influenced by each player’s stats. If Player A has a dribble stat much higher than Player B’s tackle stat, Player A will blow by him almost every time. I say almost because each stat represents an average number roll. With a stat of 50, for example, it’s possible to roll about 15 points above or below that number. Fortunately, Ganbare! Super Strikers shows the percent chance of each pass, tackle or shot succeeding to eliminate guesswork. For every tile the ball is in the air, such as for a pass or shot, it loses 10 points from the number rolled. As such, longer passes and shots have a better chance of being blocked by defenders or saved by the goalie. However, some players have special abilities, each costing SP and AP (Ability Points), which not only boost the likelihood of success, but inflict status effects on hapless opponents. Reminiscent of classic RPG mechanics, players can be poisoned, silenced, frozen, rendered naked (not what it sounds like), or have Death cast on them. Some abilities even allow players to teleport short distances or partially camouflage themselves. Game planning for these is usually done on the fly since opposing stats and abilities aren’t shown. It can be a bit frustrating, but ultimately rewarding after developing a decent strategy. How many balls has he broken trying to go for a header? Certain limitations on players are a bit confusing. While every player except the goalie can slide tackle, only one player can do it per turn. There were several times I had a defender miss a slide tackle, then have to move my other defenders to stand around the ball handler like they were forming a wall for a free kick. On a related note, the only penalty I saw in the whole game was offsides. This is the anime-inspired world Ganbare! Super Strikers lives in; poisoning or paralyzing an opponent isn’t a penalty, but receiving a pass behind the last defender is. The game is divided into two modes: Story and Arcade. Story Mode has you not only make a player, but name and design the crest and uniforms for a local team using a somewhat narrow selection of choices. I was less miffed by this compared to not being able to select a position or help determine my starting stats. You’re always a forward, and you’re always the team’s best shooter. Granted, Ganbare! 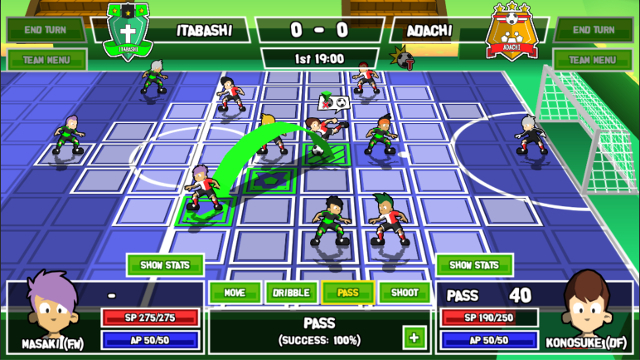 Super Strikers does allow you to change formations and move players around the field. The catch is that there are only two or three formations and each player is obviously built for their listed position. Defenders are all terrible shots and forwards are bad tacklers, except for your original character who starts off better than everyone at almost everything. The closest thing to a through ball is passing to no one. The goal (Ha!) of Story Mode is to win 14 matches: seven for the National Cup in Japan, then another seven with a predetermined set of Japanese players in the World Cup. Every match has three stars to earn by accomplishing various objectives (e.g. don’t concede any goals or inflict a certain status effect). These stars award various equipment to grant status immunity, special abilities or stat boosts. If a player uses an ability a few times, they’ll permanently learn it. Since matches can be replayed and every field player can learn every non-goalie skill, you’ll likely treat this like Magicite in Final Fantasy VI, doing a lot of equipment swapping to make sure everyone has most or all of the available abilities. Considering this is called Story Mode, there isn’t much of a story in Ganbare! Super Strikers. Your character is mostly silent, letting the other starting forward, Takao Sekozawa, do most of the talking. Takao occasionally mentions how happy he is with the team’s success, but most of his dialogue is explaining how the game works and who certain opposing players are. At one point he casually mentions a player who became cold and distant after his parents died in a car wreck. It’s delivered with the same gravity I might mention what I had for dinner two days ago. Even at the World Cup section, where all those players Takao pointed out or got smack talked by are now teammates, they rarely ever speak. Even before this point most of them just drop a couple sentences of trash talk and contribute little else. I would have loved to see more interaction among teammates, particularly with more details on their past interactions. Or, you know, more about the kid whose parents who died in a car wreck. It’s also jarring to zoom out or play with the camera. Ganbare! 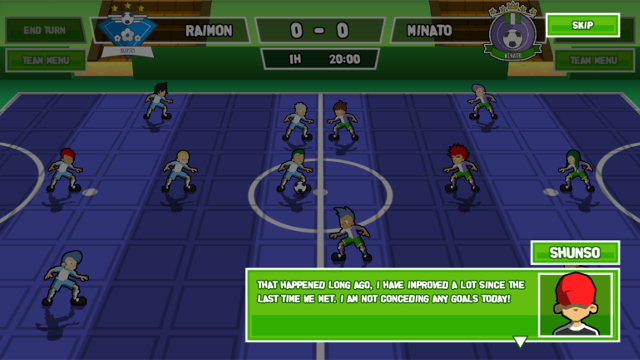 Super Strikers performs very well, in part because it keeps the graphics almost excessively simple. There are no fans present, players have minimal animation and there are only two different fields, both empty save for a few environment pieces which wouldn’t look out of place in Dragon Quest Builders. 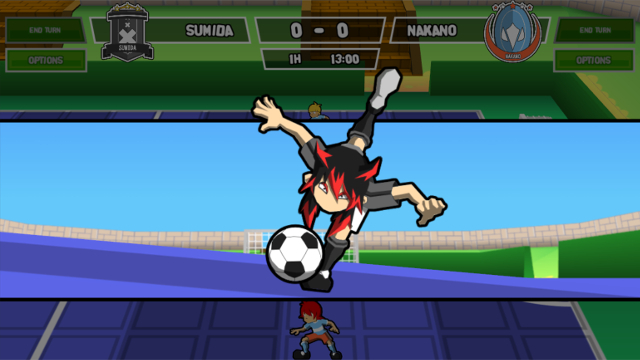 Special ability animations are heavily inspired by sports anime, as are several sound effects. They often overpower the music, which even if it were louder seems like it’s deliberately trying to be background noise. The only thing softer than the Wii Sports-esque tracks are the cheers after every goal, which are so muted I expect to hear “And there was much rejoicing” before them. After each Story Mode match, players gain experience based on how active and successful they were. Gaining levels improves stats almost across the board, as well as SP and AP totals. Moving doesn’t gain experience, nor do failed checks like missed tackles, bad passes or missed saves. As a result, players who regularly and successfully handle the ball level much faster than anyone else. This leads to a wildly unbalanced and top-heavy team. In most of my matches, half the team didn’t earn any experience. When my character hit level 30, my best defender was level five and my goalie, who can’t be controlled outside of picking a save ability, was level two. Nothing is impossible, game. I like my chances. Ganbare! 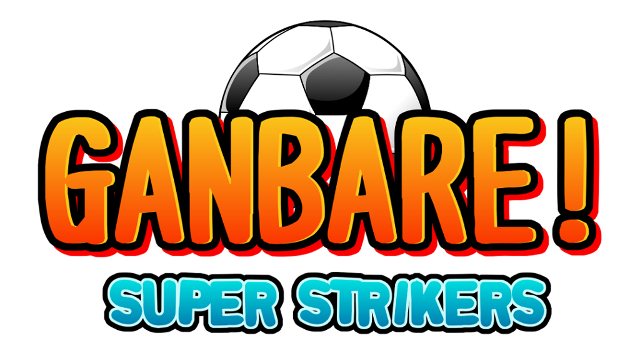 Super Strikers‘ Arcade Mode is split into Quick Match, Tournament and League. All allow you to play as the local Japanese and World Cup teams featured in Story Mode in 7-on-7 or 11-on-11 play, respectively. Tournament sets up an 8-team bracket while League creates a match table and has everyone play each other round-robin style. Sadly, the teams don’t seem balanced. The last couple teams from the National Cup and World Cup easily outclass the earlier ones, so there’s little reason to play as anyone else. Of course, this pales in comparison to my biggest gripe with League play: it doesn’t work. If the schedule for any round is such that a CPU match is the last game, hitting “Play” will simulate that game, then kick back to the schedule and show the game as not being played. This inescapable purgatory happened in the first round of every league I tried to make. When I deleted said leagues, I had a 50/50 shot of the game locking up and needing to be force-closed. While that problem is specific to League play, the AI is a problem everywhere. It usually plays smart, but it tends to do the same thing every time it kicks off. If it doesn’t see a clear move forward, it will often not do anything and immediately end its turn. By arranging the defense and midfield into a series of “V” shapes I effectively trapped all their forwards and midfielders, since players can’t move diagonally or through each other. The other team responded by holding the ball until the clock ran out. This worked in every match of every mode in Ganbare! Super Strikers. Trapping forwards is more dramatic at a 45 degree angle. There are other bizarre bugs, with some more egregious than others. Sometimes characters away from the play appear to have the ball in random frames of their running animation. In the first Story Mode match, I let an opposing forward have the ball two feet in front of my net for four turns in a row and he didn’t shoot. At one point I cleared the ball to the opposing team’s corner to run down the clock. Not only did they not go after it, their midfielder suddenly tried to tackle my forward. I tackled him and somehow caused the ball to appear at my character’s feet. Ganbare! Super Strikers doesn’t need bug testing so much as straight-up fumigation. It’s disheartening to see a game with a solid concept that badly needed more work before being released. With how exploitable the AI is, I wound up needing less than nine hours to finish Story Mode, four of those coming after discovering the “V” strategy. Even if the bugs were fixed, Ganbare! Super Strikers has some glaring problems in its game mechanics which lead to lopsided teams and unbalanced matches. The limited customization and lackluster Story Mode are the missed penalty shot that seals it for me. I do hope the developer keeps updating and adding onto what’s here as I did enjoy the core gameplay. However, for $10 I can’t in good faith recommend this in its current state. Scott Ramage wears many hats. From podcasts to football games to let's plays to pro wrestling matches, he has dabbled in several fields while pursuing a Japanese degree to go with his English degree. One of the few constants for him is that he's been a fan of video games since first playing Pole Position on the Atari 2600.